The Academy of Medicine, Engineering and Science of Texas (TAMEST) on Monday released its two-year study analyzing the overall impacts oil and gas development has had on Texas. And while the study does identify some data gaps and areas of concern – most of which are being addressed by state and federal regulators – the bulk of the report is positive in tone, showing that fracking is being done in a safe, environmentally friendly manner and having tremendous positive economic impacts in the Lone Star State. This study adds to a list of reputable studies by no fewer than seven government agencies and several academic institutions have concluded fracking is not a major threat to drinking water. Most notable is the U.S. Environmental Protection Agency’s (EPA) recent five-year study that found “the overall incidence of impacts is low” from fracking across the country. CO2 emissions from these producers are down 20 percent since 2005. 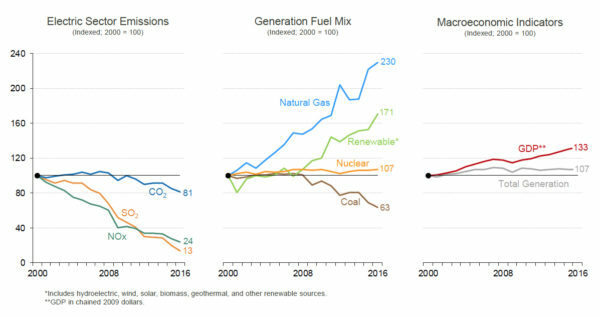 SO2 emissions have declined 87 percent since 1990. NOX emissions are down 79 percent since 1990. Mercury emissions are down 69 percent since 2000. As this latest study of the nation’s largest oil and gas producing state shows, it is absolutely possible to manage the risks of oil and gas development while reaping the benefits that it brings.